What a surprise! 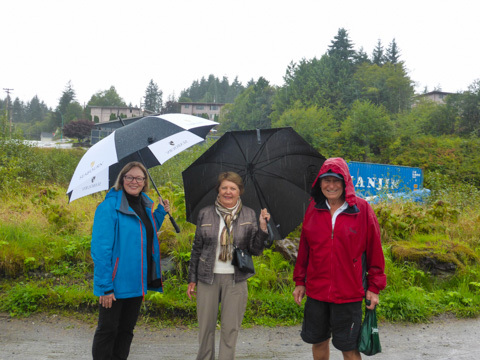 We strolled down the gangway and see Sandy, Sarah, Ric and David waving to us. They had been able to see the Sojourn docking and they came over to meet us. 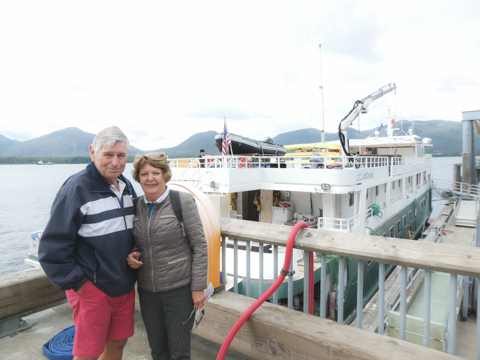 We went over to see their ship, the Uncruise which was much more of an expedition ship, smaller – only 76 passengers and with even more toys than the Sojourn. The Salts went to the ferry to make their connections to Denali and the four of us went to explore Ketchikan and find coffee. 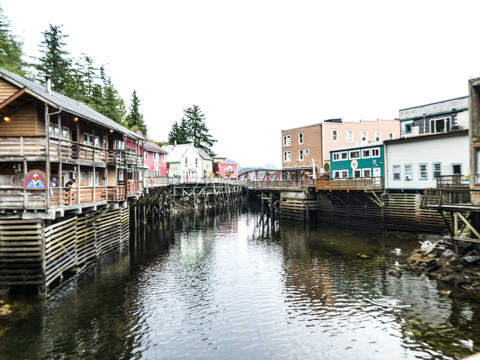 Of all of the Alaskan towns James and I visited, Ketchikan was the one that looked like you could live there. Very hilly, so many of the houses had a view. Many kindly locals would say as you walk up the hill: “Make noise, there is a Mama Bear around”. It is no wonder the bears were nearby, because the salmon were running. We walked up to Creek Street and watched the salmon in their struggle to go upstream, with insistent interference from a friendly little harbour seal trying to catch his lunch. We followed the road up the stream to watch the different varieties of salmon on their way to spawn. By the time the salmon are this far along they have shed their scales and soon arrive at the natal stream. Wikipedia says that salmon are a keystone species, as the nutrients in their carcasses are transferred from the ocean to both wildlife and riparian woodlands near the ocean. 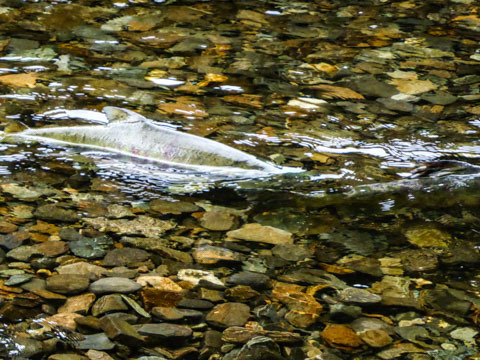 The female salmon searches for the gravel bed of her youth and uses her tail to create a depression, called a redd. She will lay up to 5000 eggs and then continue upstream before moving on to make another redd. This usually happens about seven times. After spawning, they quickly die and the owners of a house located on the stream say the putrid rotting fish smell lasts for about two months. Some males will develop humps, before they travel upstream. The hump attracts the sight of the bears, hoping to protect the females and the roe. They also develop teeth to fend off other salmon from trying to fertilise their eggs. You do see the males fighting in the streams. Some local children told me they were zombie salmon. Bears will eat salmon only before they lay their eggs. 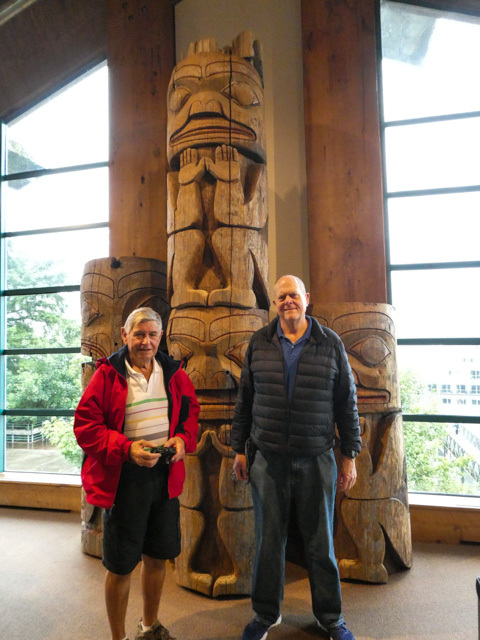 We walked from the stream up to the Ketchikan Totem Heritage Center, with beautiful First Nation artifacts. 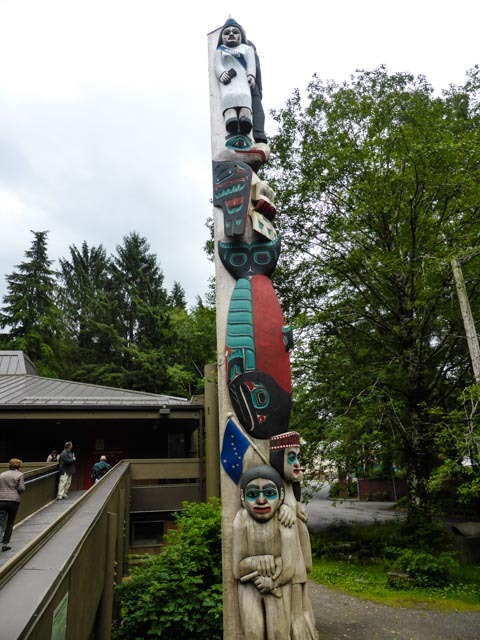 The pre-19th century totem poles are one of the largest collections of unrestored totem poles, found at abandoned villages. 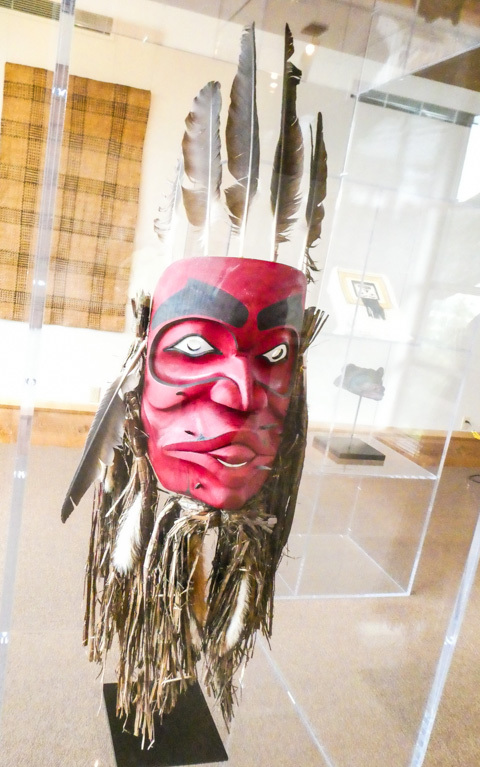 They have other crafts on display like this ceremonial robe and new totem pole. 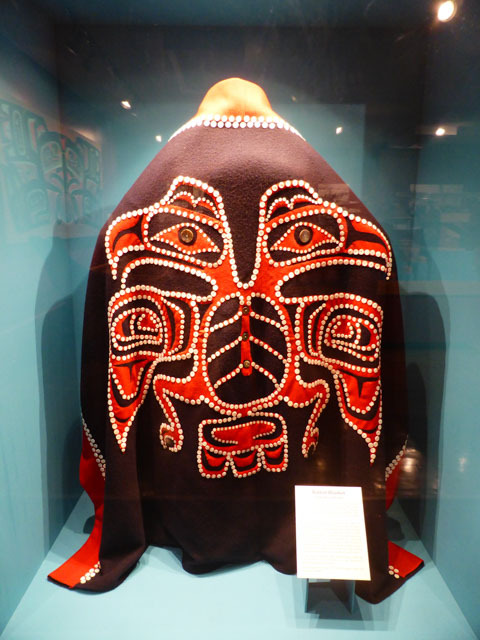 Ceremonial Robes – buttons and red colour indicate it was made after first contact. Lake Garda is so large and so Mediterranean in climate, we feel there might be a boat waiting for us. Yet while there were only ferries, we were still happy on the water. We only travelled to the lower lake because there aren’t ferries going everywhere and returning on the same day. When you are deciding where to stay, if you are getting about without a car, then our suggestion would be in the Centro Storico or Old Town. 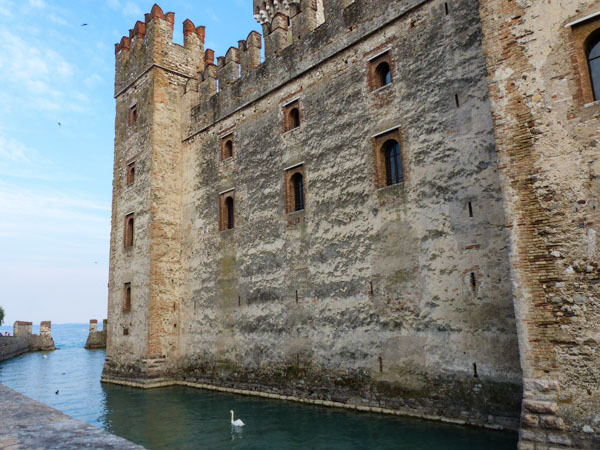 Sirmione’s Centro has Roman ruins, museums and castles. 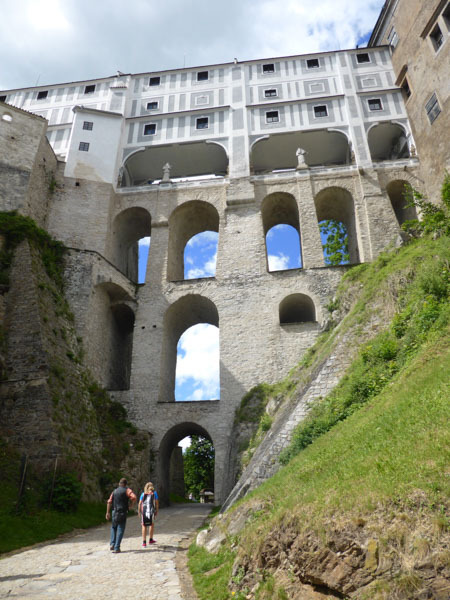 The castle even has a drawbridge, which incites a romantic notion of knights and jousts. The swans gliding through the moat was quite picturesque. 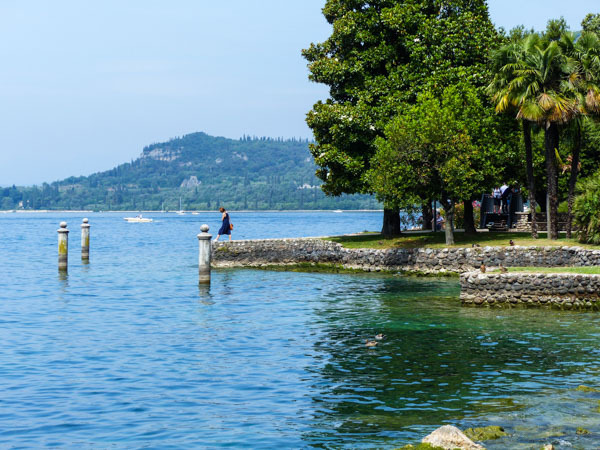 Probably the best way to arrive at Sirmione is to take the train to Desenzano del garde, the bus down the hill and jump on the ferry to Sirmione. Unless you come by ferry from another town, this would seem the best option. 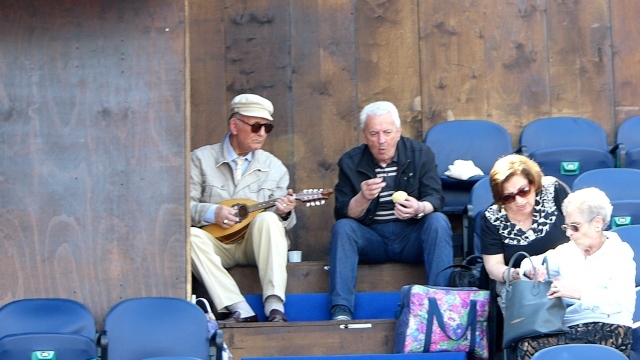 Once you know when your ferry departs, if you have time, you can have a coffee or some wonderful gelato in the piazza. 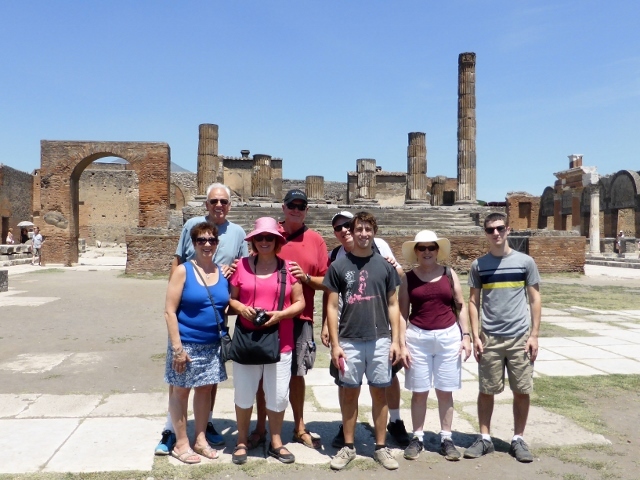 There is a spa that you can visit and also you can walk or take the Nonno’s train to the Roman ruins. Catullus is said to have had a villa here. He certainly seems to write a poem about coming back to the peninsula of Sirmioni. Every night there seemed to be a free concert both of a more classical style and also jazz on the beach full of drums and even a didgeridoo. In the evening a lot of the crowds would leave and it was wonderful to wait and stroll around town from cafe to music. 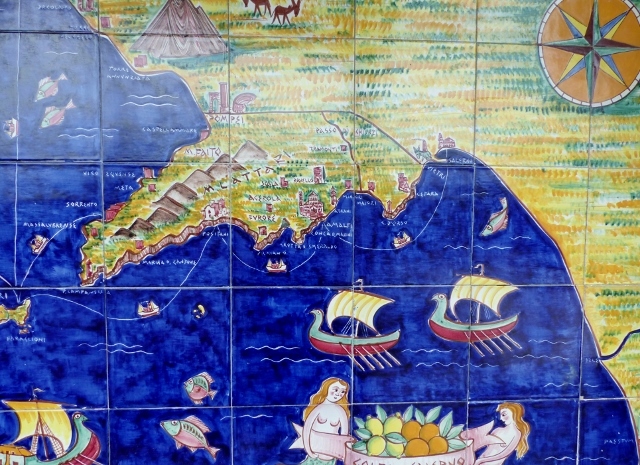 Like Catullus, we might try to write a poem about returning to Sirmioni. Feeling happy escaping the crowds, we would walk and wander waiting for the twilight. More on the Roman Villa tomorrow. Çesky Krumlov was mentioned almost every time we mentioned we were going to Prague. 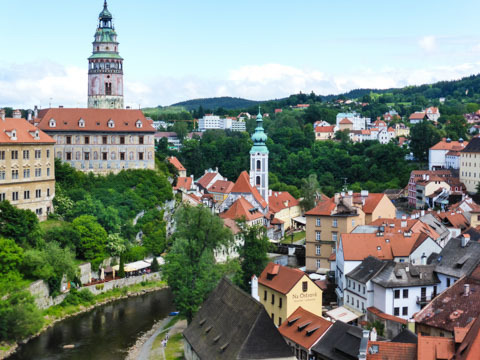 I would hear “it’s delightful” and I would say “interesting, what is so delightful about Çesky Krumlov?” Almost no one answered, but now when I recommend it, I can tell you why it is the second most visited village in Czechoslovakia. This medieval village is seriously photogenic, historic, arty and the food was wonderful. It is the village you have to plan to visit and it takes more than just jumping on a train to get here. We left Prague on one bus, then another, travelled for over two hours and just managed to get the bus driver to let us off at the correct spot. After a wander around the town, it was wonderful to go through the castle. Not all three hundred rooms but enough to see what splendour the former royalty lived in. The water coloured tower is the beginning of the castle. There is a splendid archway to link the Castle and the Theatre. 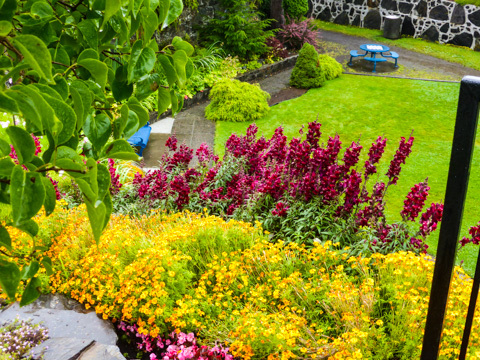 This UNESCO World Heritage site is so picturesque and so green. The medieval towers, buildings and bridges are quite lovely. We also love the idea of local ales and wines. Our favourite sign was Fairy Tale House Puppets and Wine. There were art galleries on every corner and several types of art. 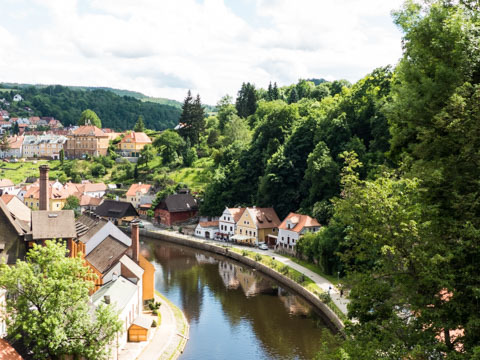 So if you find yourself in Prague, add a brief interlude in Çesky Krumlov, enjoy the meandering River Vltava and trust that you will have a delightful time. The Charles Bridge is beautiful with numerous grand religious statues on its edges. I have used this photo of the bridge because so many of the people on the bridge are taking selfies and others have photographers doing glamour shoots. These are mainly young women with boyfriends looking on. It is quite remarkable. In fact, for some, it isn’t a photo of the Charles Bridge or the Stare Mesto or a cathedral unless you are posed in front of it. Prague is such a fairy tale setting, they have come to a wonderful spot. 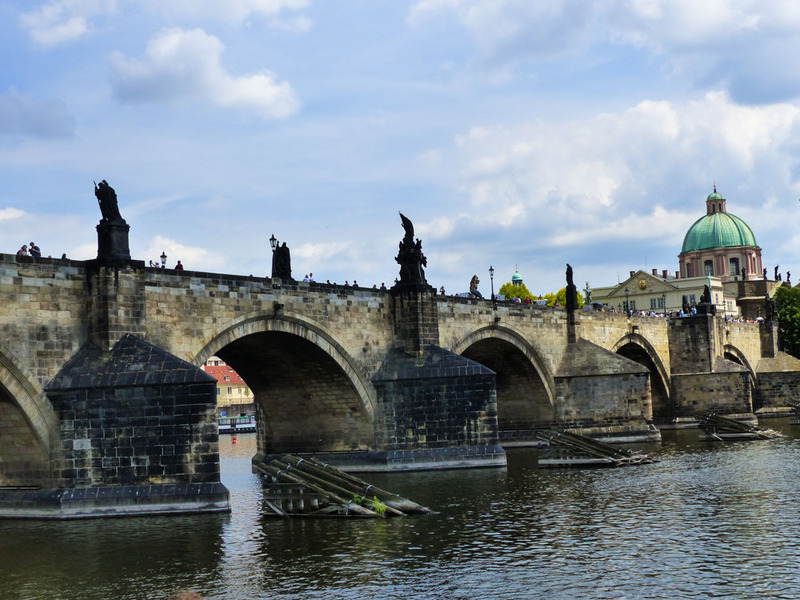 The bridge was built in 1357 for Charles IV, the first bridge to cross the River Vltava. One of the best ways to see Prague is to do a tour and we were so lucky to have Pavla from Premiant tours to take three of us up hills and on the river giving us history, sharing information and answering questions. 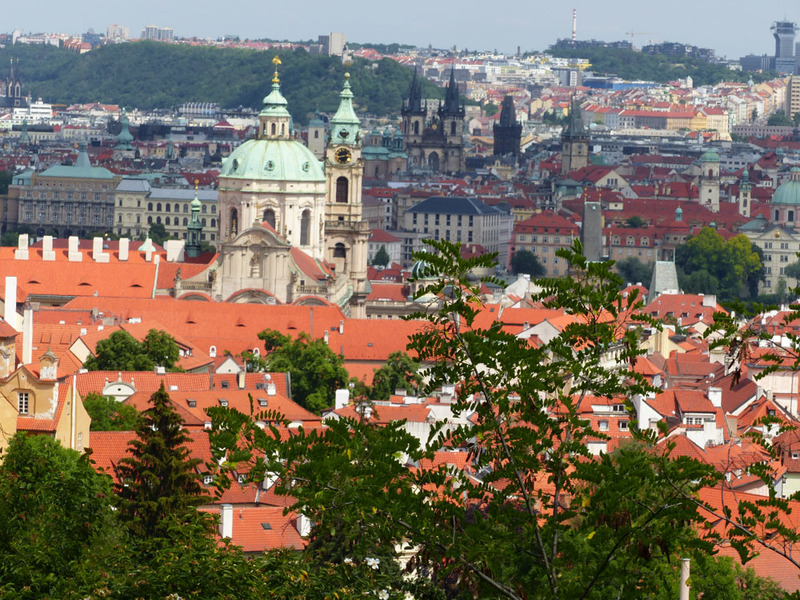 Prague is a University town and if Pavla’s passion and knowledge about Prague, history and art were generated with free university, than I think that affordable education is very worthwhile. We started in the Old Town and wandered through the Jewish Quarter and had a cruise on the river, then we went up to Prague Castle and further up to gardens and the Strahov Monastery. The monks are back and they seem to have brought back a sense of humour with them. If you didn’t know Czech people are very fond of an ale or beer. In fact, Budweiser beer was first brewed here. But the monks of St Norbert have their own take on drinking. Does anyone else see a zombie theme with the Autumn Dark Lager? 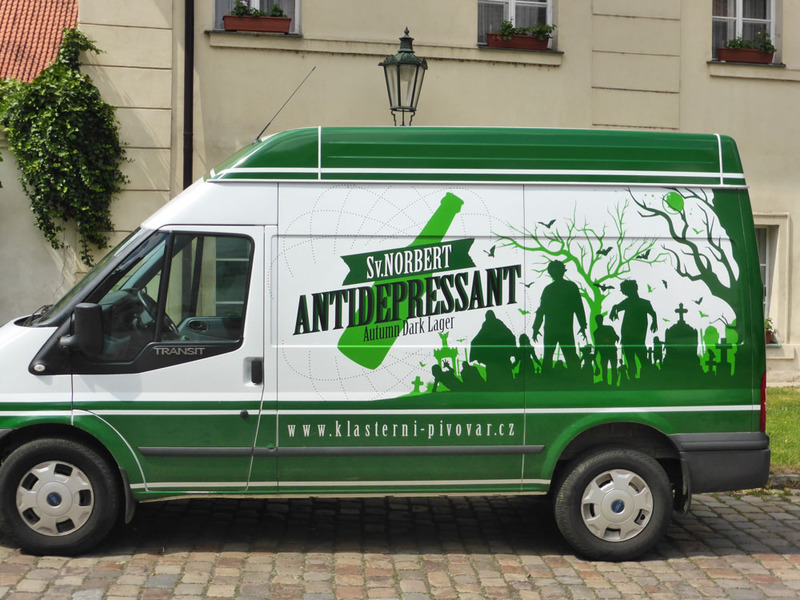 Delivery van in front of the monastery. Once you pass through a narrow lane, you walk down the to the walls of the monastery and there is a wonderful outlook back over Old Town, red tile roofs fill the foreground and the dome and belfry of Church of St Nicholas are easy to spot. Further on I can see the spires of the Tyn Church and to its right, Stare Mesto. There are other spires and churches but I can’t name them all. The architecture in Prague is easy to see and ranges from Gothic to Renaissance and Romanesque to Baroque and Modern. St Vitus’s Cathedral and the Tyn Church are probably the easiest Gothic architecture to discover. You possibly couldn’t miss them. 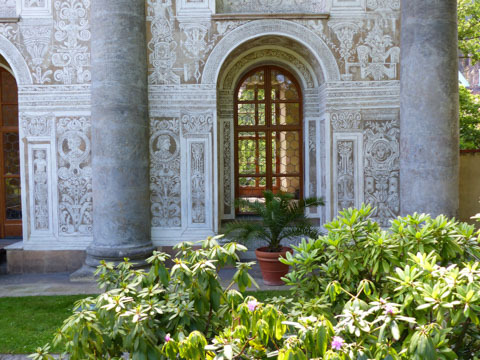 The Royal Garden takes more investigation to find and has a building with Renaissance sgraffito which is magnificent. Isn’t this sublime, like a fine piece of lace. Tulips came here before they came to Holland. I think that would be another story all together. 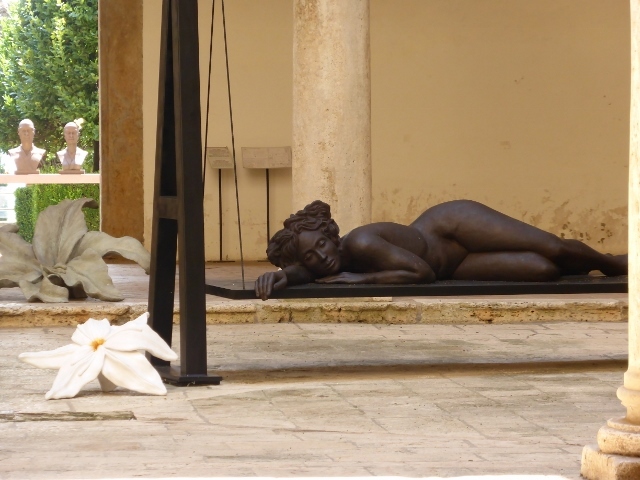 Wine country, Etruscans, hilltop villages, green Italy and a perfectly transformed Renaissance village are all covered in today’s blog. 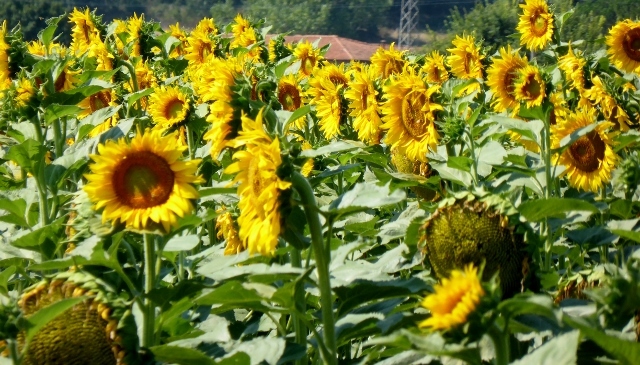 As you travel through the vines, sunflower farms and rolling hills lush with vegetation and crops, you see green Italy, not one of stone and concrete but another Italy altogether. Many of the vines are of the Montepulciano Vino Nobile grape and are some of Italy’s best wines. 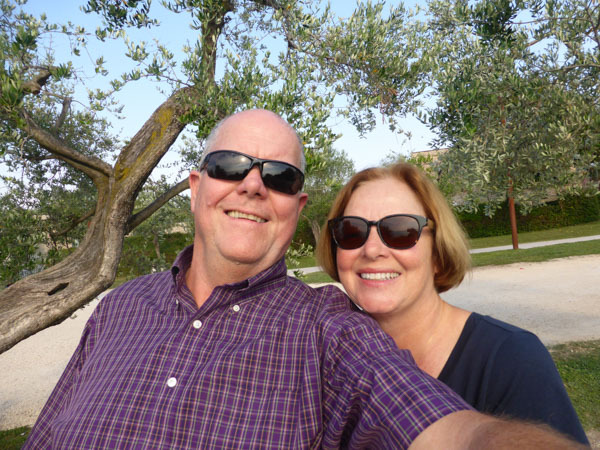 They even had Montepulciano plums at our agriturismo. 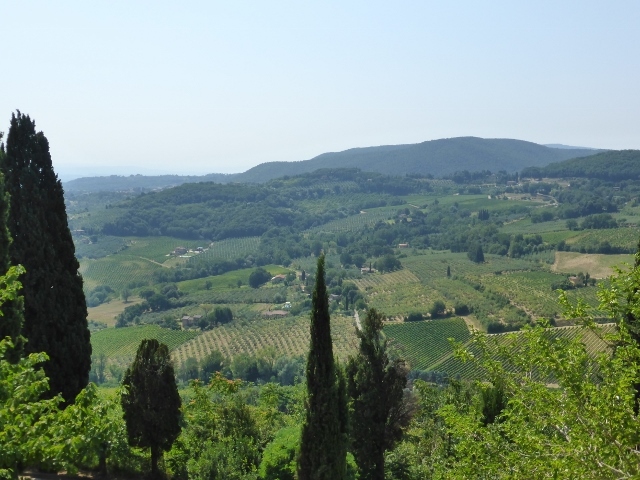 Montepulciano is a hilltop town and its roots go back to the ancient Etruscans. 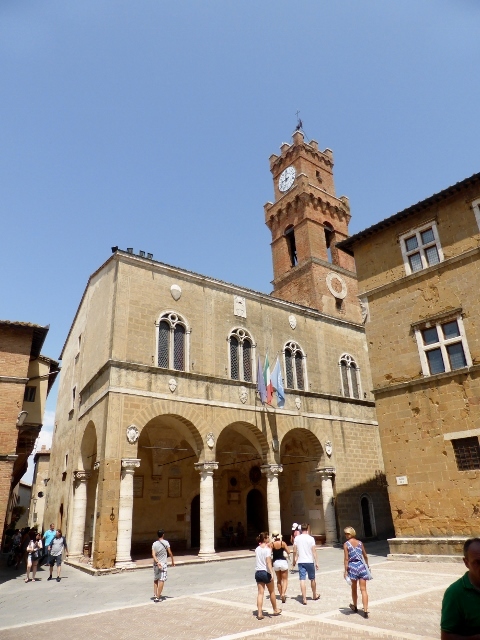 On our second day in the area, we drove into the countryside to visit Pienza, a town created by Pope Pius ll. Beginning in 1458, Pius ll worked with the Florentine architect, Bernardo Rossellino to create a city model that was laid out in an orderly, pleasing and rational manner.It was a town where urban décor would benefit the citizens. He included new areas for the needy, so they could share in the bounty. He was a truly humanist Pope, standing up against slavery and the persecution of Jews. Most of us have passed bakeries, where the aromas are pushed out into the noses of passersby to entice them into the shop. 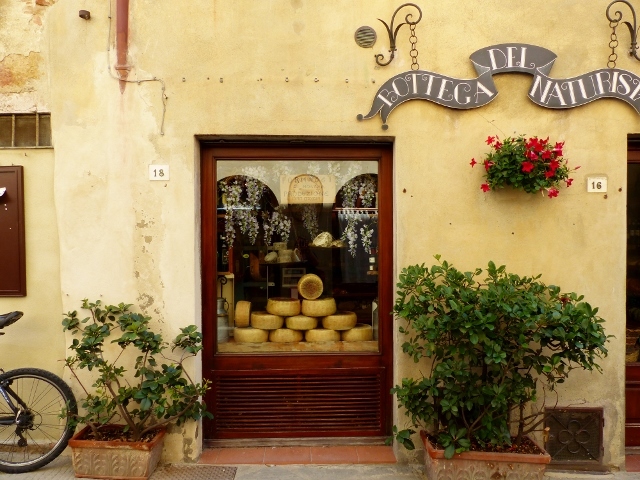 In Pienza, the cheese shop had a fan sending out aromatic scents to pull you into their shop. 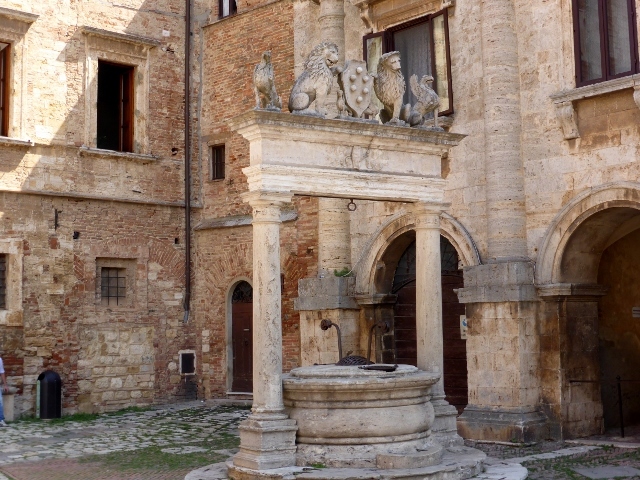 Pienza is noted for its Pecorino cheese. Also known as cacio, it is made from sheep’s milk. The sheep feed on the verdant hillsides eating aromatic herbs like it thyme, penny royal and absinthe. There was also large amounts of art, including giant bracelets and rings. When in Italy, you read about the Etruscans and if you Google them, the story will begin “Their language didn’t survive, so we know nothing about them, but they were an elegant people.” Now with DNA samples, we may see that the Etruscans (Eighth century BC- First century AD) came from the western Anatolia, near Izmir in Turkey. The Etruscans are fascinating because ‘elegant and mysterious’ suggests a people of Bond men. But in the Etruscans’ case, women had a significant role to play in daily life. The Etruscans were also great artists and seem to be the ‘creators’ of the famous hilltop towns in Tuscany and Umbria. 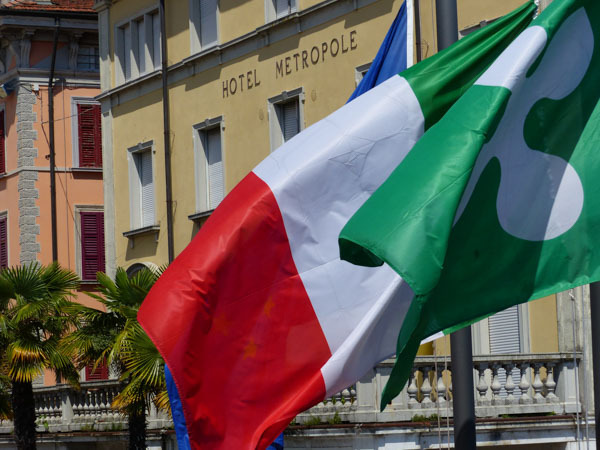 Italy’s history goes back beyond the Romans. 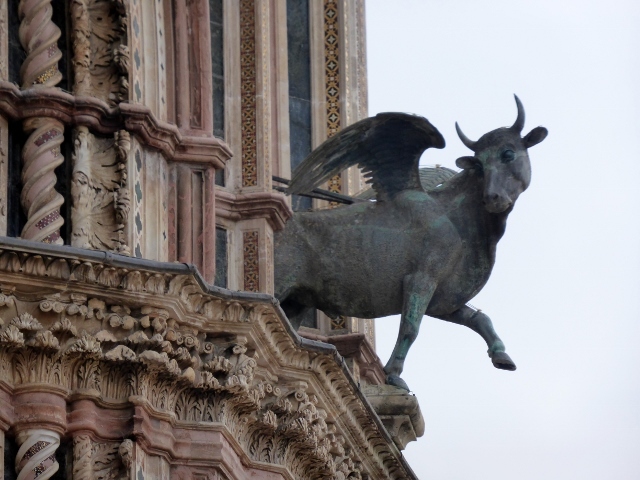 The geneticists did not stop with testing ancient Etruscan DNA, but they also tested cow DNA in the region and found a match with Tuscan bovine DNA in the same area of Western Anatolia. Beef is a food of choice in Tuscany and Umbria. As we left this area, we saw sunflower farms, some almost fully ripe and others that had just been planted. They are joyous to see and enjoy. Next trip we will stay in some of the hilltop towns, but staying in the country also has it’s benefits. 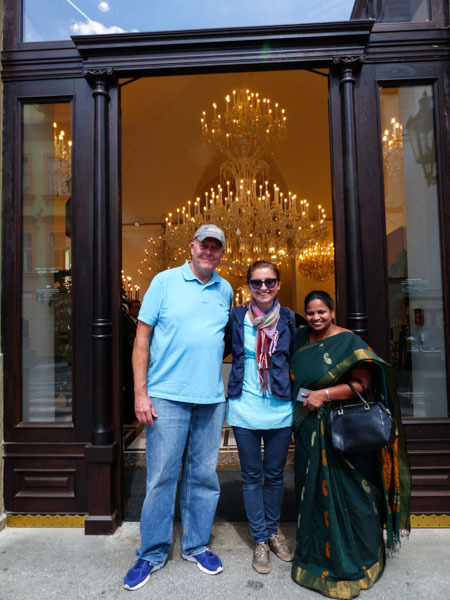 We had two thoughts after leaving Genoa. Where can we go that won’t find us competing with the bus tour groups that are Italy’s typical summer fare? (Apologies to the Umbrella ladies) Let’s type into Google: “Back roads of Tuscany and Umbria”. Bagni di Lucca might be just a little too quiet, perfect for private parties and weddings, but you would want to expect a very quiet time here. 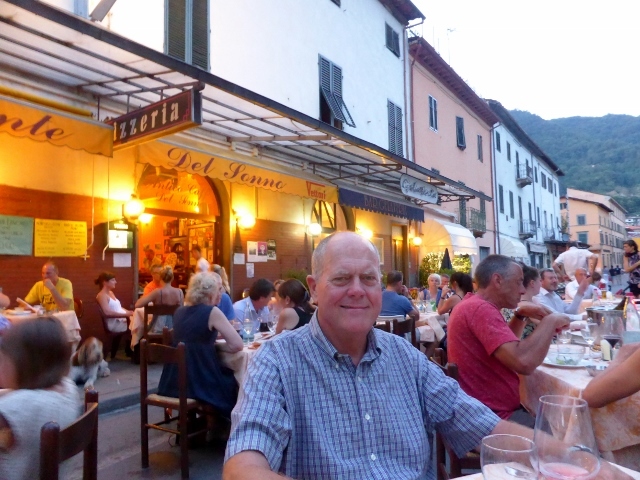 What was perfect for us, is that the best local restaurant created dining a la strada otherwise known as “Let’s close the road and put the tables outside, because it is just to damn hot.” They had excellent live music each evening, everyone was was there. There is no air conditioning in this part of Italy and it seemed imminently sensible to just divert the traffic. The weather cools off as soon as the sun goes down, everyone was happy. 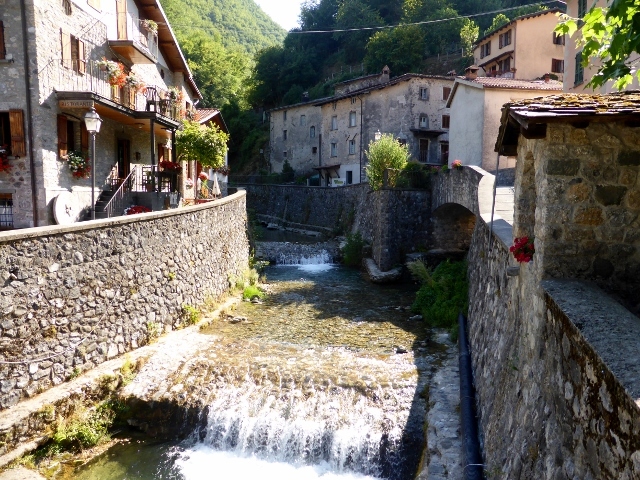 Knowing the next day was going to be hotter still, a drive to Garfagnana and the Cave of the winds, where it is 10.7 C all year round. 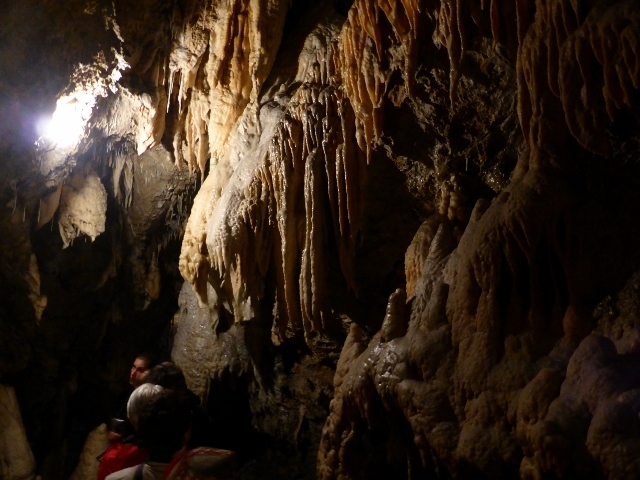 It was a great drive, we felt like we were in Switzerland and a two hour tour of the Caves in cool, ultra-healthy air was sensational. 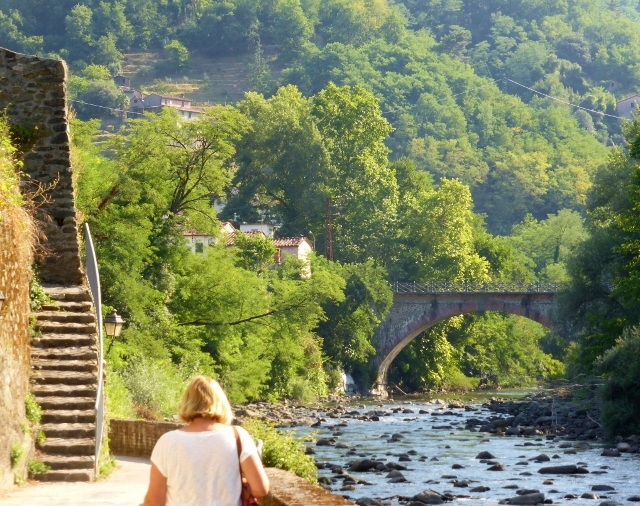 If you do go to Bagni di Lucca, go in June or September, because there are plenty of walks. 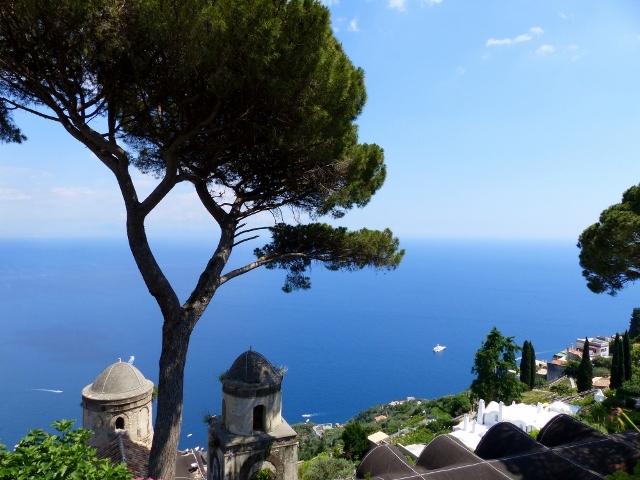 We followed the passegiata there, that Elizabeth Barrett and Robert Browning would stroll. 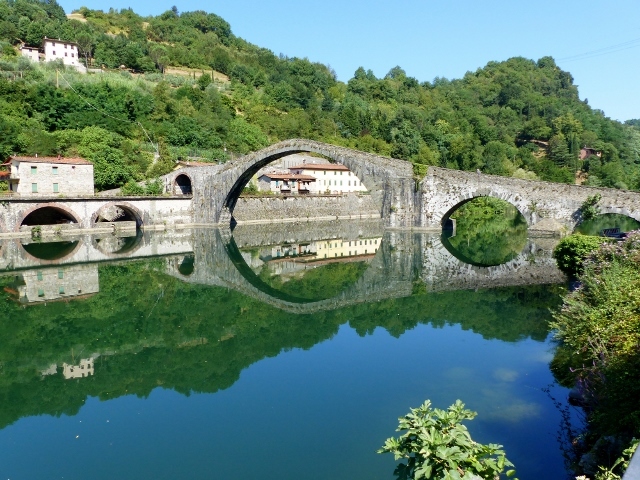 For my return, I will be heading back to Garfagnana. 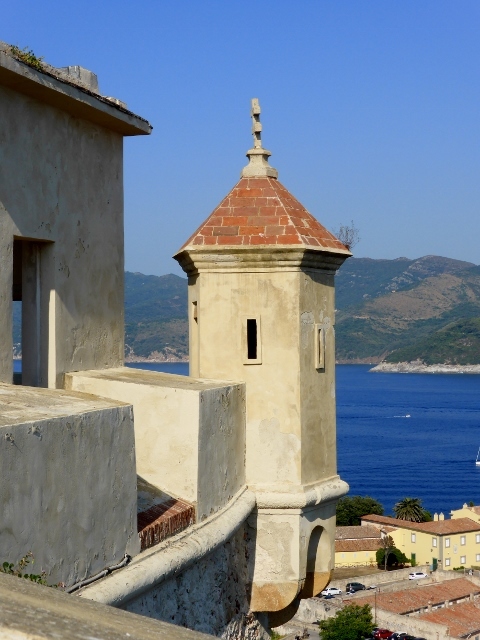 There are some remarkable places in Italy, the island of Elba is quite interesting, historic and gorgeous. First of all, this island is so full of iron that one can not rely on a compass for a true reading. Climbing up to Fort Falcone, one of three fortresses protecting this city, you can see the earth is rusty with iron. The Etruscans mined here, the Romans vacationed here and Cosimo built forts hereto protect his iron mines. 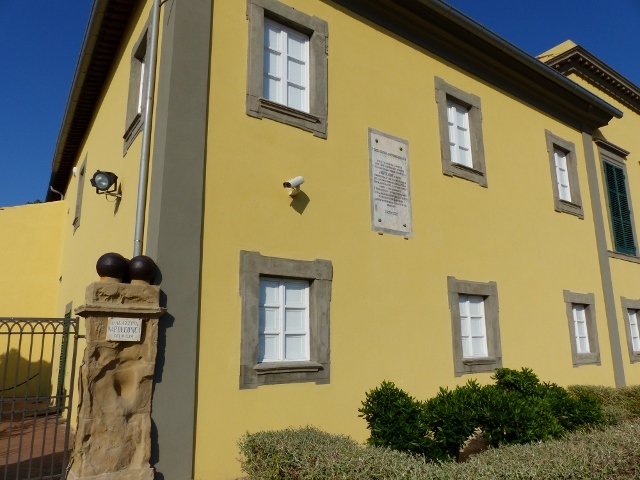 The two favourite sons of Portoferraio are Cosimo l de Medici, Grand Duke of Tuscany, founder of Portoferraio and Napoleon who was a prisoner here and spent every moment on Elba trying to escape. I am not sure I would spend my time trying to escape from this paradise, but Napoleon certainly did. 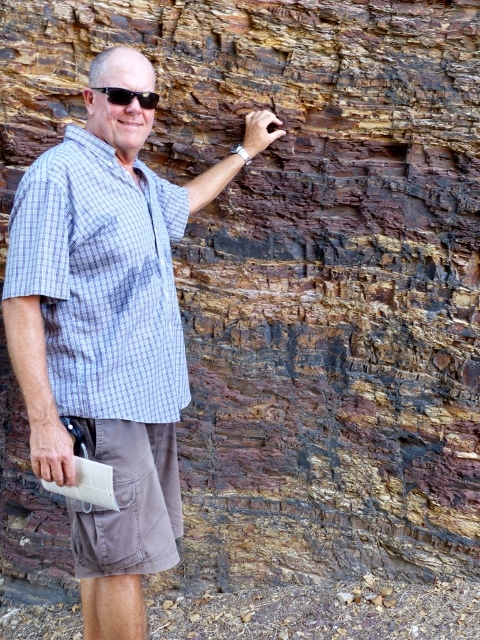 He is said to have written on one wall: “Napoleon can be happy anywhere.” Seriously? Most of us would be very happy to spend a few years here. 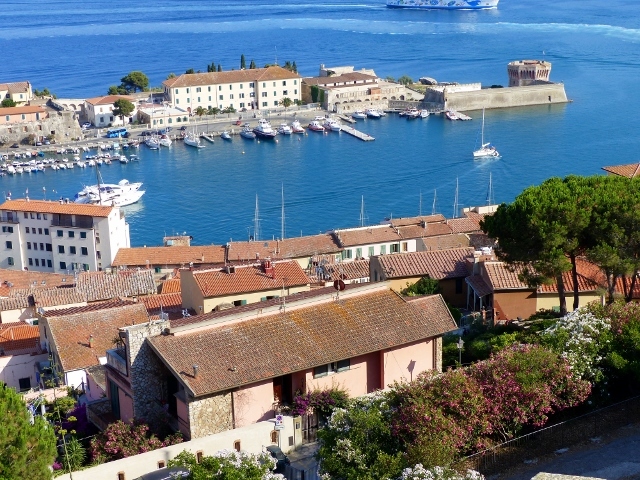 Like Sydney, Portoferraio has a Martello tower, built by Cosimo, to protect the entrance to the small harbour. A fleet of pirates came and terrorised the populace and may have been the impetus behind all of these forts being built. Heikell said it was a fleet of 42 sail. This is more than my mind’s eye conjures up when talking about a pirate raid of about three ships. 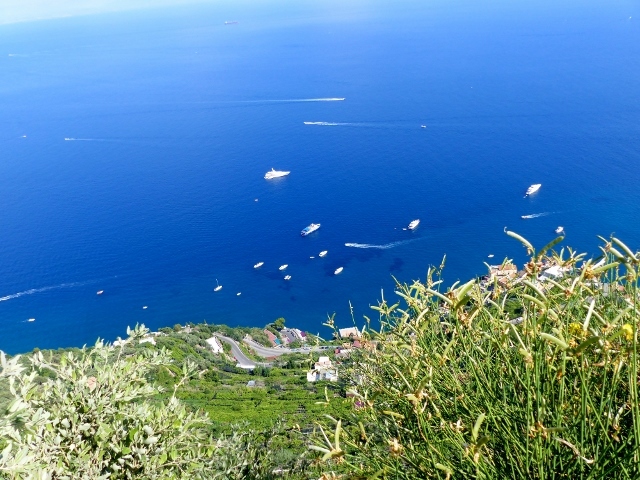 Most visitors come for the beautiful beaches in and around Portferraio, others go fishing. 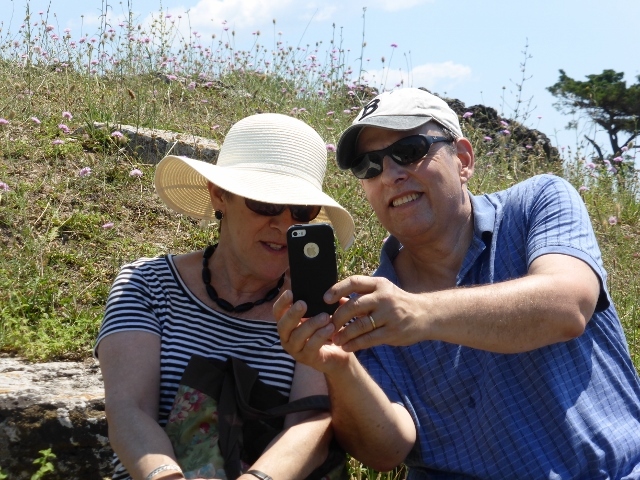 We walked up to the Tower Falcone and the museum, watched the very fast three man soccer set up in nets, in the piazza, while we ate our gelato. We would be happy to come and visit again in a few years. Mosquitoes drive us all crazy, waking us in the middle of the night by buzzing and biting us. They were a scourge in antiquity too, closing down Caunus and Roman cities like Ostia Antica and Paestum. The mosquitoes carried the malaria that made living in these ancient cities impossible. 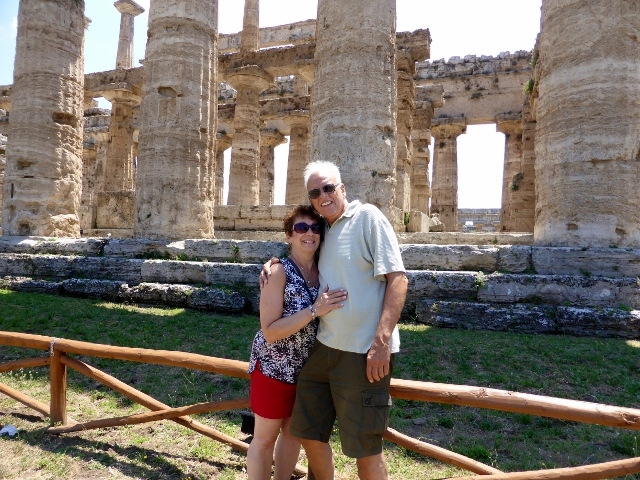 The ancient ruins are Paestum were never covered or collapsed, the area silted up and the malaria kept everyone away for millennium. 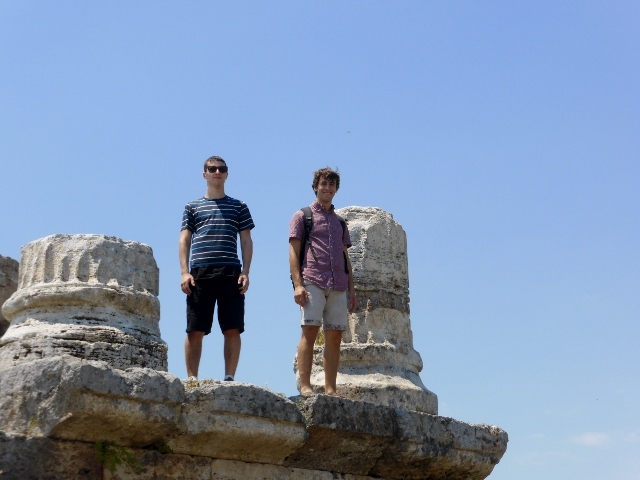 These ruins from the Magna Graecia were rediscovered in the mid-19th Century and became a destination on the Grand Tour, so popular with the educated young men of that time. The temples are so beautiful, that it comes as a surprise that they were likely painted in white, red and black. 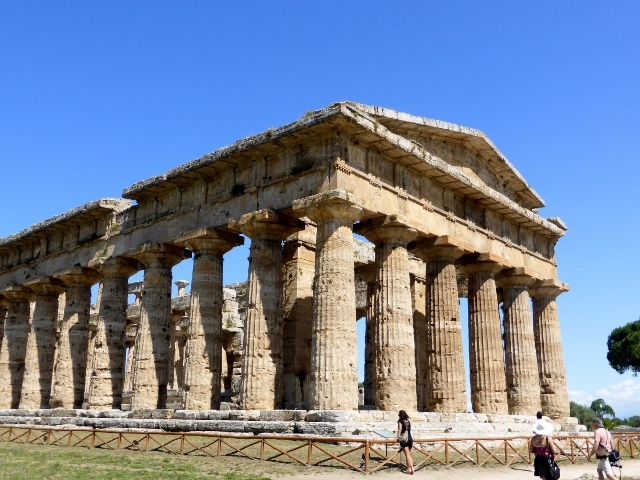 There is a discussion of painting part of the temples to provide an insight as to how Paestum would have actually looked at the time. I think the Sydney Vivid team would do an excellent job. 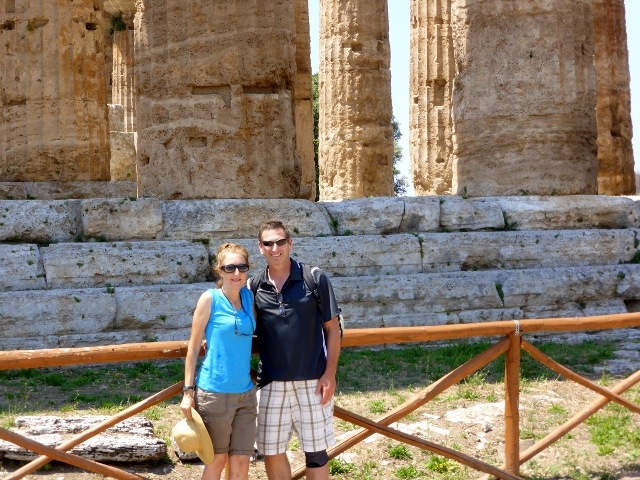 There aren’t large crowds at Paestum, Doric columns abound though. The Pasteum museum is a small but perfectly formed museum. It is full of artifacts like tombs, including Diving Boy tomb found nearby, amphorae and votive offerings. 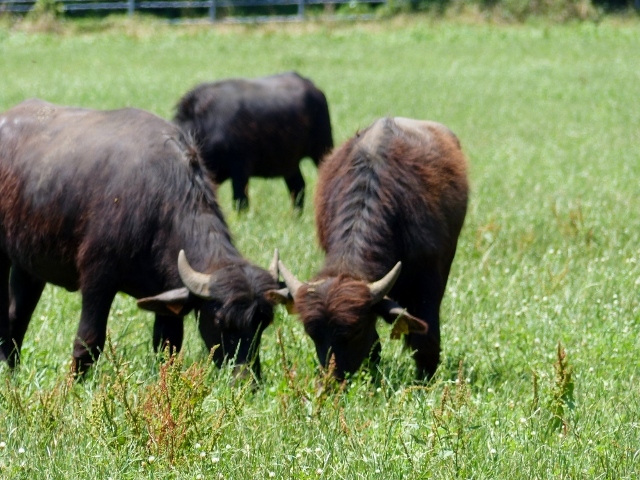 One of the areas important economic activities are water buffalo dairy farms. There is an old sepia photo of the water buffaloes grazing underneath the temples c 1910. You can smell their presence. They love Schubert and Brahms and they make great cheese.